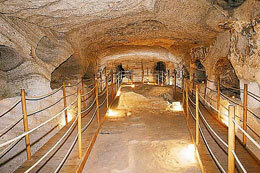 Near the village of Trypiti and in a small distance from the ancient theatre the Christian Catacombs can be found. They are Milos’ most famous monument and unique in its kind in Greece. The Catacombs are each year visited by a great number of people, about 30,000, according to the curators. As many other monuments of the Cyclades, they were first explored by L. Ross in 1844, who reported that they had already been looted. Their systematic study, however, was the work of professor G. Sotiriou. It is a subterranean cemetery, carved in the region’s soft stone, dated to the 2nd century AD that continued being used until the end of the 5th century AD. It must have been the cemetery of the first Christian community of the island. The monument is comprised by three catacombs with an equal number of funeral chambers (A, B and C) and smaller corridors, which start from each chamber. The corridors’ width varies between 1 and 5 m. Their minimum height is 1.60 meters, while the greatest does not exceed 2.50 m. The funeral chambers and the secondary corridors have the same arrangement: on their sides niche-like arched tombs (arcosolia) are carved, whereas tombs can often be found also on the floor. The tombs were covered by stone slabs, from which only parts are preserved on their original place. Some tombs have niches for placing lamps or funeral offerings. The arcosolia are invested with plaster, blue for their internal side, while their external border is decorated with a red stripe. Many inscriptions were found in the Catacombs; they are a further proof of the complex’s funerary character. Catacomb A has a particularly spacious funeral chamber, where double tombs can be found, thought to be family graves. In one of the tombs of a secondary corridor an inscription is preserved, informing us that Stefanis, daughter of Milon, rested there. Catacomb B has some very interesting features. The only two-storey tomb is found there. Some of the tombs of chamber B had, according to G. Sotiriou, a monumental façade that consisted of a pair of pillars and a thorakion (stone trestle) that closed the space between them. On one of this chamber’s arcosolia there was the painted image of a fish, a common Christian symbol, which is not preserved today. In the middle of the chamber there was a rock, interpreted as an altar by Sotiriou. This would mean that the Catacombs were also places of adoration. Due to the rock’s shape, however, that resembles a sarcophagus, it has been sustained that this was the tomb of an important person or of one of the first bishops of Milos’ Christian community. On one of the arcosolia of chamber B the most known inscription of the ones found in the Catacombs is still preserved. It informs us of the names of the first Christians, as well as the degrees of their clergy. In the central chamber of Catacomb C traces of a fresco with boughs and birds is preserved. It is one of the few Early Christian frescoes that survive in our days. Today’s form of the Catacombs is due to some 20th century interventions, such as the entrance to the funeral chamber B and the passages that unite the three, originally independent, catacombs. For the opening of these passages some walls and arcosolia had to be demolished. The existence of only one entrance was considered necessary, not just for reasons of guarding, but also due to the collapse of the Catacombs’ original entrances. The disintegration of the dilapidated stone and the collapse of part of the roof of chamber B led to the construction of a crude cement support which destroyed the architectural remains that documented the existence of the tombs’ monumental façades. Today only chamber B is accessible to the visitors, who can move around the room on a wooden platform that protects the floor but mars the monument’s aesthetics.